Since the headline appeared, Alexion has confirmed the move. President of the State Senate Martin Looney, a longtime New Haven Democrat, was unable to cough up much info: “All I heard today” -- late Monday, September 11 – “was Alexion was leaving.” U.S. Representative Rosa DeLauro pronounced herself “shocked.” Was the unflappable DeLauro shocked because Alexion had reneged on a $26 million bribe paid to the company by Governor Dannel Malloy to assure its continued presence in Connecticut? Such enticements were routine during the Malloy administration. And Alexion was not the only Connecticut business in recent years to take the money and run, sometimes to Massachusetts, once derisively called Taxachusetts, sometimes to New York or to other welcoming, less rapacious states. Vaping – essentially, smoking air infused with nicotine and some harmless chemicals – is the technological solution to a problem presented by cancer causing cigarettes. As people move from coffin nails to vape products, the therapeutic tax levied to discourage cigarette smoking diminishes. The tax gatherers’ solution to the loss of revenue is to slap a tax on retail vape sellers, the result of which, owners of vape shops in Connecticut agree, will be the destruction of retail vape outlets – which ultimately will result in fewer taxes collected. Some political analysts were convinced very early on that Obamacare, hardwired to fail from its inception, was simply a prelude to a universal health care system. Universal health care is a government run, tax supported health insurance system that undoubtedly will put insurance companies, as we know them, out of business. No private company can compete in a public market with a government run health insurance company, which is why, come to think of it, there are no privately run veterans hospitals. The government veterans hospitals are poorly run, as Blumenthal, much concerned with veterans’ affairs, well knows. They are poorly run for the same reason the Sahara would run out of sand should the government assume control over desserts or, for that matter, Venezuela, once considered the Paris of Latin America, now a free market desert experiencing shortages of toilet paper, whose socialist overlords are forced to quell riots in the streets by hungry ex-socialists. The fall of Venezuela began when socialist Hugo Chavez nationalized the oil industry. Socialist Venezuela, which has more oil than Saudi Arabia, ran out of sand, so to speak. Bernie Sanders is a socialist, the sort of politician who has learned nothing and forgotten everything. Last week, Blumenthal stood with Sanders on a dais, as Sanders fulminated against insurance carriers and called for universal health care. Blumenthal, U.S. Senator from Connecticut, once known as the insurance capital of the world, now favors the nationalization of health care, about 18 percent of the nation’s Gross Domestic Product. Other quasi socialists supporting universal health care along with Blumenthal are Sen. Elizabeth Warren, the Huey Long of Massachusetts, Sen. Cory Booker of New Jersey and Sen. Kamala Harris of California, all considered progressive contenders for the Democrats’ 2020 presidential nomination. 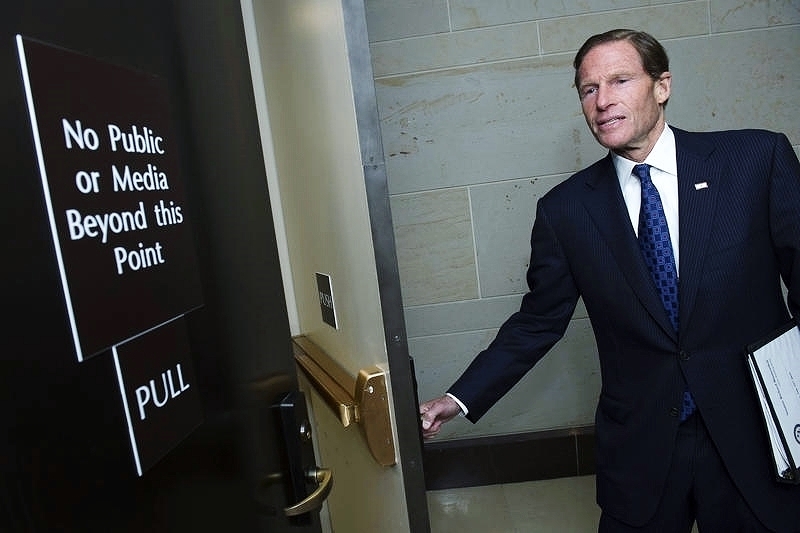 The media in Connecticut is just too timid to ask Blumenthal how long after Bloomicare becomes law it will take before the insurance industry in his state becomes a desert, resulting in massive job losses.